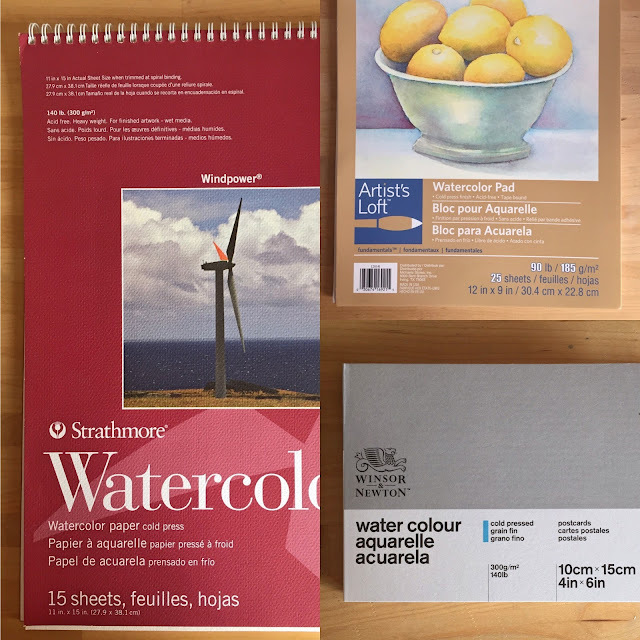 A few weeks ago, I did a review on the paper types we crafters often use to create our cards or layouts, and a reader requested a watercolour paper comparison. So here it is! Thank you for the suggestion. I am very excited to get started. Once again, this is a long one. I'd apologize, but I like to be thorough. I also added some fun math at the end! Strathmore 140lb Cold pressed watercolour paper - this is my usual paper type. The Artist's Loft 90lb Cold pressed watercolour paper - a less expensive craft store brand. Winsor & Newton 140lb Cold pressed watercolour paper - a more expensive brand. The test image I used today is the beautiful tulip from Clearly Besotted's "Forever Friends" stamped using the MISTI with Antique Linen Distress ink. I chose this ink to create a "no line" look as I thought the stamped lines would take away from what I'm really trying to showcase today. All the images are painted using my Gasai Tambi 12 colour palette and my size 4 Prisma water brush pen. All images were allowed to air dry, I did not speed up the process with my heat tool. Up first is the Strathmore 140lb cold pressed paper. Very little warping when water is applied. Water seems to pull the colour across the area giving more of a "watercolour" look instead of just being coloured in. Felt very confidant being able to add additional layers of colour without damaging the paper. Cost vs. Quality is excellent, comes in various sizes and is relatively inexpensive. About $20 CAD for a 15 sheet pad of 11x15"
Next is the Artist's Loft 90lb Cold pressed paper. Paper took damage after second layer of colour, pilling up and seemed to get mushy after the third. Incredibly inexpensive paper to purchase - less than $8 CAD for a 25 sheet pad of 12x9"
Finally the Winsor & Newton 140lb cold pressed paper. More expensive "high-end" paper. I paid about $12 CAD for a 15 sheet pad of 4x6"
Painting small images whether from a stamp or freehand is one thing, but we generally don't stop there. At least I don't. After the image area is completely dry, I like to create a halo around the image because I love that dreamy look. Here are the pictures of each piece with the light blue halo. Strathmore: For myself, I will be sticking with this for my watercolour paper. If the opportunity to try something new comes up, I will certainly not turn it away, but for my budget and my art room and the pieces that I typically create this paper is exactly what I need. It is an excellent quality for the cost, it takes layers like a dream, moves the water and paint the way I would expect and want; in the event that I mess up beyond being able to fix it, I'm not devastated if I have to toss it; aside from the amount of work that I just put in. Artist's Loft: This is definitely an instance of you get what you pay for. While I have many other Artist's Loft products and mediums - this paper is not something I would ever buy again. If my daughter decides she wants to watercolour paint, I'll let her use what I have left of this, then upgrade her to something else. My inability to comfortably add layers of colour to this, destroyed any illusions I had that I could find some use for it in my art room. Winsor & Newton: This paper held up with multiple layers of colour, there was very little warping and zero damage. The colour moves across the page the way I expect it to when I think of watercolouring. That being said, for what I do, this paper behaved too much like the Strathmore for me to justify the difference in price. If you are a serious watercolour artist then this may be more what you are looking for, but then you would probably all ready have your paper of choice picked out. A little bit of fun math, because why not. Given the prices at the time of this writing (above), I thought it would be fun to work out the cost of each 4x6" piece. I hope you enjoyed this review. If you haven't all ready, please follow me over on the right side bar so you don't miss any future reviews and projects, if you are viewing this via mobile device, scroll to the bottom and click "View web version" first. You can also follow me over on Facebook. If you have any questions about this review or have an idea for a future review, please toss me a line in the comments section below. I would love to hear from you. *disclaimer: I am not set products to review, nor am I paid to review them. I review the products that I find interesting and that I purchase myself, with my own money; I receive no incentive, payment or reward to do so. All reviews are based off of my personal experiences with them and are my opinion only.